Plant & Food Research and HortPlus have joined together to produce an electronic spray diary application (SprayLog) that is simple to use across a range of different horticultural industries. 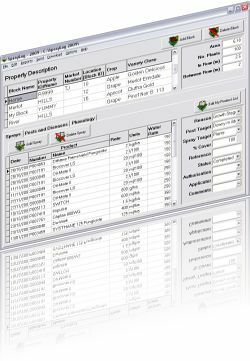 SprayLog is an application designed to make the recording of spray applications on your properties easy. With it's simple and generic block/spray framework, it can be used for almost any industry. Along with spray applications, SprayLog can help you record product stock levels, pest and disease monitoring and blocks key growthstage dates. Sharing your spray diary can be done by either printing a spray diary report, emailing your spray diary or exporting it to excel. Other reports and summaries include a planned spray report that can be given to a spray contractor or staff member, a summary of the total amount of product or chemical applied. All NZ registered products and a huge number of supplementary products are included. Almost all crops & varieties are included. Industry standard varieties & codes are used where available. It's becoming more common for industries to require/request an electronic spray diary from growers. A simple, user-friendly interface which is easy to understand and navigate. You don't need a new computer to run SprayLog, it will run fine on nearly any windows computer. SprayLog is made by New Zealanders, for New Zealand growers.